Are you looking to keep your kids entertained during the May school holidays? If so why not send them to JN Sports Soccer School and Holiday Club. 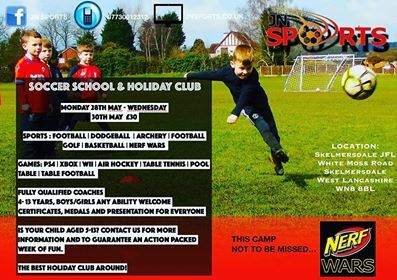 The Soccer School and Holiday Club will be taking place between 28th May and 30th May at Skelmersdale JFL, White Moss Road, Skelmersdale. For further information you can phone: 07730012312 or visit jnsports.co.uk.